Page 1 of the photos from the McCauley side of my family. Single click onto an image to see it at full-size. A number of Gadd family members are buried in this churchyard in unmarked graves, including Jonathan and Hester Gadd, Elijah Gadd's parents and my great great great grandparents. 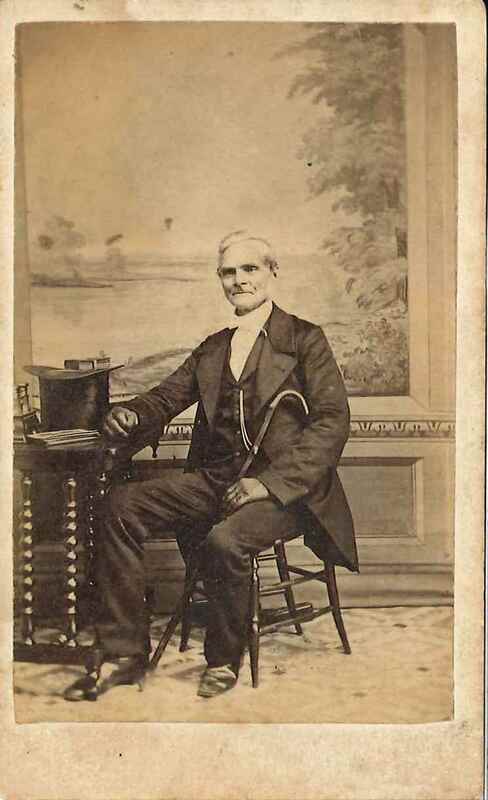 My great great great grandfather (1798-1889) taken at the studio of C. J. White Photo, 14 & 15 Clare Street, Bristol. This photographer is recorded as working at this address between 1867 and 1876, during which period the photo was probably taken. Scan of original photo kindly sent by Vicky Blair. William Cox was the father of Elijah Gadd's first wife, Sarah Ann, who died on the voyage to Australia. My great great great grandmother (1800- 1889) taken at the studio of C. J. White Photo, 14 & 15 Clare Street, Bristol. This photographer is recorded as working at this address between 1867 and 1876, during which period the photo was probably taken. Scan of original photo kindly sent by Vicky Blair. Rachel Cox was the mother of Elijah Gadd's first wife, Sarah Ann, who died on the voyage to Australia. My great great great aunt (1836-1913) taken at the studio of Willberts, 5 Bristol Bridge, Bristol. This photographer worked at this address from 1908. Scan of original photo kindly sent by Vicky Blair. Anna Maria Cox was the sister of Sarah Ann Gadd (nee Cox), my great great grandmother. 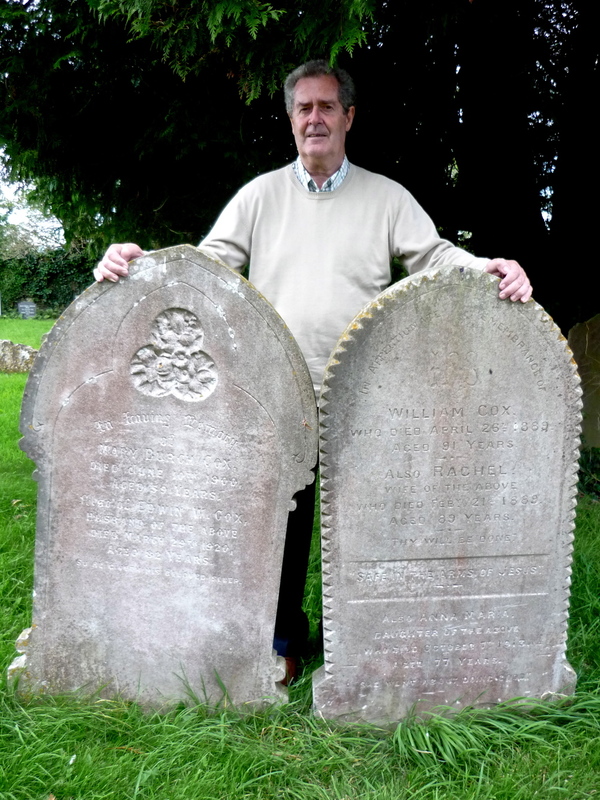 The graves of my great great great grandparents, William and Rachel Cox, in Stanton Drew churchyard, Somerset. Their daughter Anna Maria Cox, son Edwin William Cox and daughter-in-law Mary Burch Cox are also buried here. Font likely to have been used in the christening of members of the Cox family, including my great great grandmother, Sarah Ann Gadd (nee Cox), on 17 April 1831. Interior of church where Elijah Gadd married his second wife, Sarah Ann Hawgood. It is likely that Elijah Gadd was one of the stone masons involved in building this old part of the university in 1856. It is likely that Elijah Gadd participated in this march in April 1856 that won the eight-hour day for building workers in Victoria. 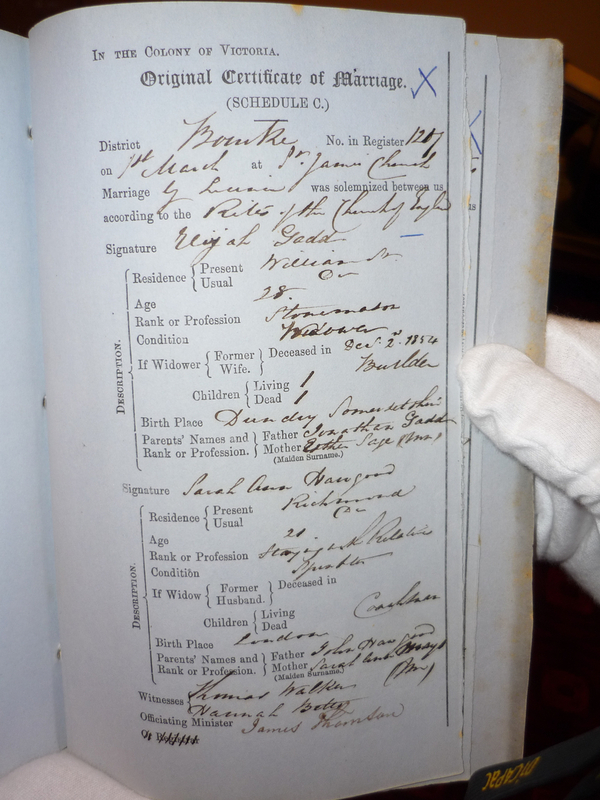 He registered with the Society of Operative Stonemasons two months before the march on 17 February 1856. Elijah and Sarah Ann Gadd lived in this street when their daughter, Sarah Jane, died in 1862. 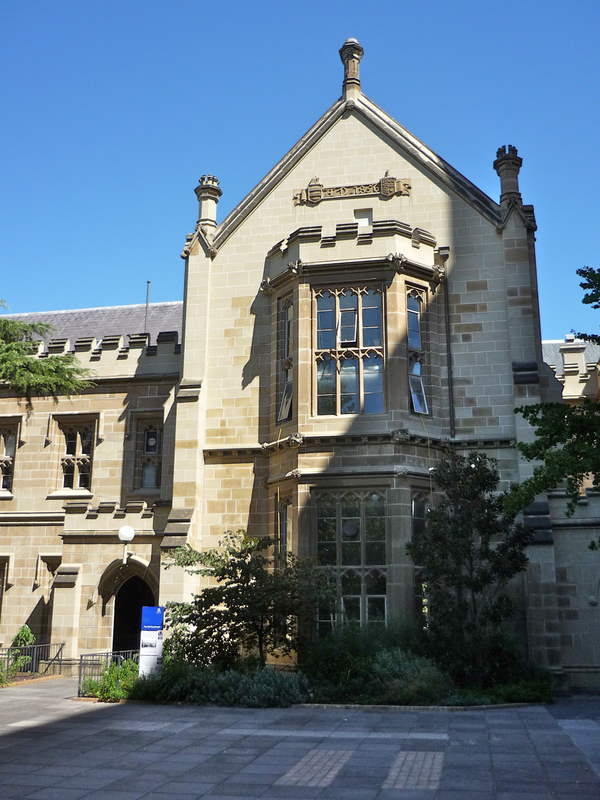 Elijah was presumably employed as a stone mason at the time during the building of Melbourne University. The first (wooden) town hall (second building from the left), was completed in 1857, but this soon proved too small. 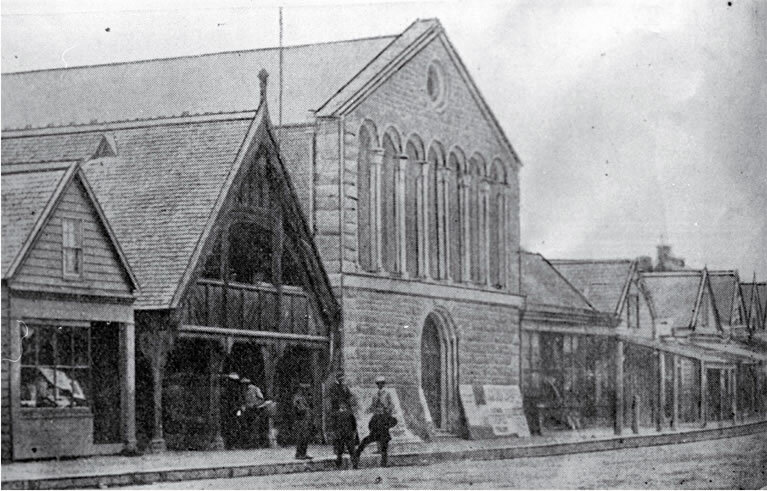 Elijah Gadd, my great great grandfather, provided the stone for and built the second, much larger town hall (to the right of the photograph), completed in 1864. The stone hall was so badly damaged by an earthquake in 1869 that it was condemned and, in 1873, finally destroyed by fire. The Supreme Court used to sit in the wooden hall. 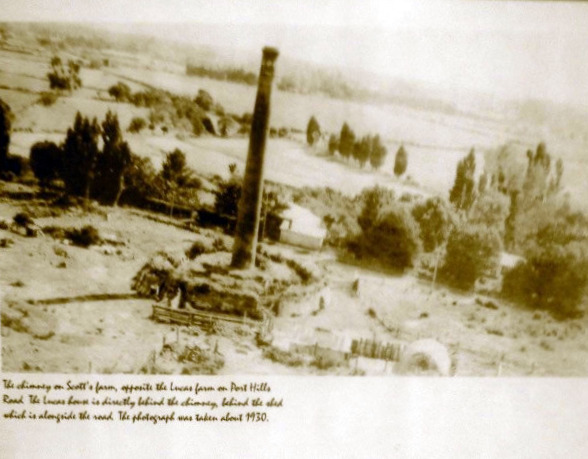 The remains of Elijah Gadd's brickworks in Heathcote, photographed in 1930. The site was purchased by William Tasman Scott in 1920 and this photo is reproduced with the kind permission of his grandson, Tasman L. Scott. This house at 313 Port Hills Road, Heathcote, was built and lived in by Elijah Gadd. The photo is reproduced with the kind permission of Tasman L. Scott. This house at 321 Port Hills Road, Heathcote, was bought for my great grandparents by Emily Ann's father, Elijah Gadd. The photo is reproduced with the kind permission of Tasman L. Scott. 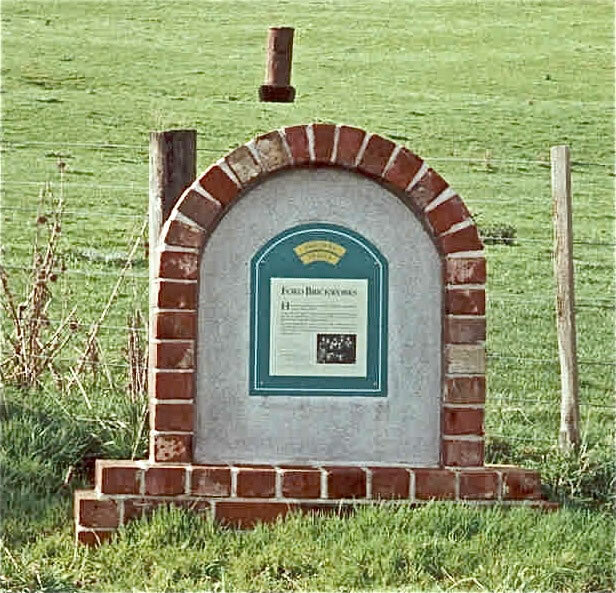 Brick recovered from the site of the house built by Elijah Gadd for him and his family in Heathcote, Christchurch, New Zealand. The brick, inscribed EG, was made in his brickworks. It was kindly obtained for me by Sarah West. This hotel was jointly established in 1877 by my great great grandfather, Elijah Gadd, and John Marsden. The same hotel as it was in 2006, much modified and renamed the Valley Inn Tavern. The building had to be demolished after it was damaged in the Christchurch earthquake of 4th September 2010 and the subsequent aftershock of 8th September 2010. In Barbadoes Street Cemetery, Christchurch, New Zealand. The inscription reads as follows: "Sacred to the memory of Sarah Ann the beloved wife of Elijah Gadd who died Dec 2nd 1854 aged 24 years Also of Samuel their son who died Jan 26th 1855 aged 9 weeks Also of Sarah Ann the second and beloved wife of Elijah Gadd who died Jan 12th 1871 aged 31 years Also of Sarah Jane their daughter died May 23rd 1862 aged 14 months"
My great great great aunt (1832-1905), the third sister of Elijah Gadd, and her husband who emigrated to New Zealand on the ship Dunedin in 1874. The sixth child (1869-1957) of Elijah and Sarah Ann Gadd (nee Hawgood). She was the godchild of my great grandfather, Henry James Ford. Photo kindly provided by her great grandson, Phillip Colebrook. Henry James Ford sailed from London to Lyttleton, New Zealand in this ship in 1868. It was a vessel of 1214 tons. This plaque was erected by Robert Bird on behalf of the Eltham and Districts Historical Society in Hu Road, Eltham, to mark the site of the brickworks operated by my great grandfather, Henry James Ford, and his son of the same name in the 1890s and early 1900s. The bricks in this plaque are Ford bricks gathered locally. Robert Bird is the husband of Janice Emily Bird, a granddaughter of Eva Emily Ford. Taken in Eltham, Taranaki, New Zealand, this was one of the old photographs printed on a series of commemorative drink-mats produced in New Zealand in the early 1990s. My grandmother, Sarah Ann Ford, is on the left and her sister, Eva Emily, on the right of the photograph. My great aunt and the 4 children of her and William Thomas Faull and the 5 children of her and Edward Burr Foreman. 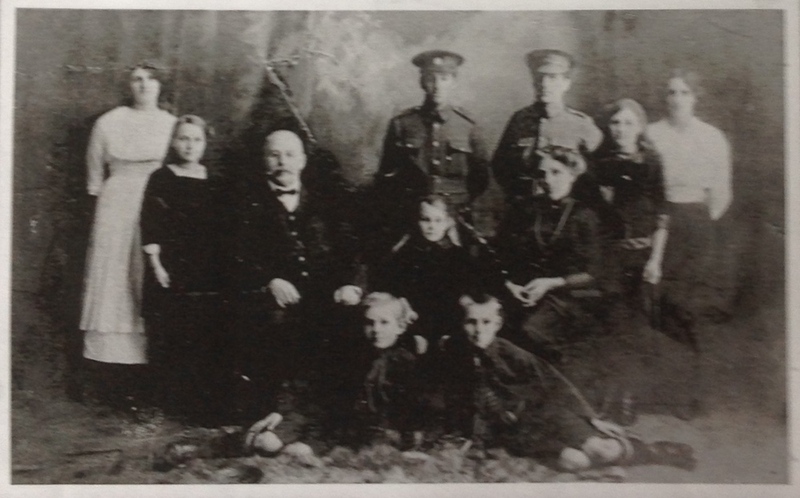 Photo presumably taken in 1915 before the two Faull sons left for WW1. Back Row: Muriel Emily (Alma) Faull (1897-1939); William Thomas Faull (1893-1917); Henry James Faull (1894-1916); Gladys Elizabeth Faull (1896-1982). Middle Row: Ellen Doreen (Nellie) Foreman (1906-1961); Edward Burr Foreman (1860-1918); Dorothy May Foreman (1910-1984); Elizabeth Ann Foreman (1874-1965); Olive Foreman (1902-1972?). Front Row: Christopher Raymond Foreman (1908-1984); Edward Alick (Mick) Foreman (1904- 1994). Taken on the marriage of my great uncle and aunt on 5 July 1906. My grandmother, Sarah Ann Ford, was bridesmaid. My great grandparents, John Jnr. McCauley and Eliza Jane Donaldson, were married in this church on 14 November 1873. Photo taken in June 2010. 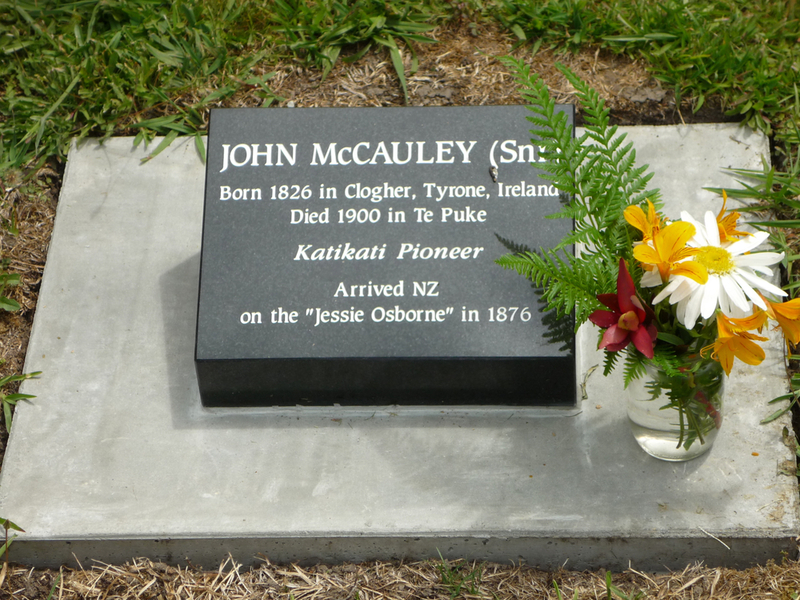 The McCauley family sailed from Liverpool to Auckland, New Zealand in this ship in 1876. It was a full-rigged vessel of 1058 tons. John Snr. and John Jnr. McCauley were allocated farmland in Rea Rd. Katikati adjacent to where this photo was taken during the McCauley family reunion of 10-12 February 2012. Photo taken at the McCauley family reunion of 10 -12 February 2012. Those in the photo are all direct descendants of either John Jnr. and Eliza Jane or of William James.